The Rubenstein Forum, a multi-purpose conference center, will be built in the Mott building’s place. The Charles Stewart Mott building was knocked down this past week. 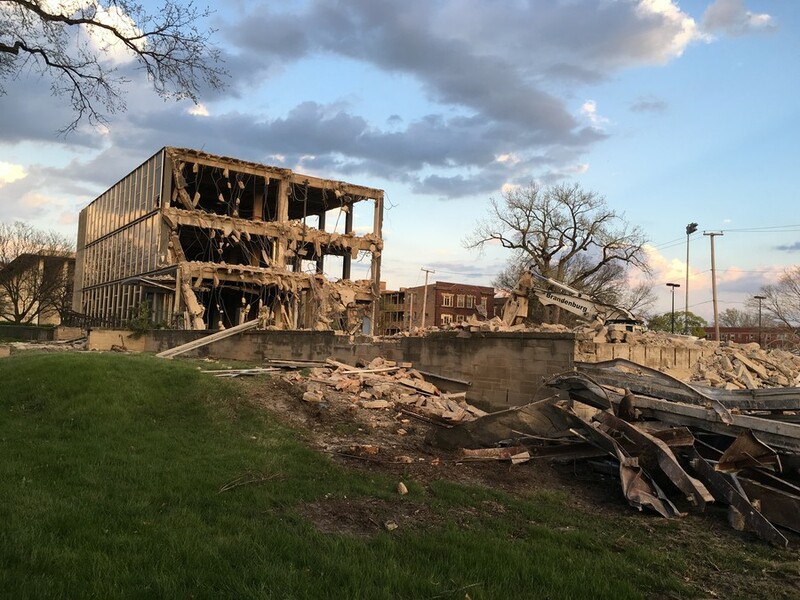 Demolition of the Charles Stewart Mott building is underway as the University makes room for the Rubenstein Forum, a multi-purpose conference center to be built on 60th Street between South Kimbark and South Woodlawn Avenues. The structure that will rise in Mott’s place will serve as a hub for lectures, conferences, and visiting scholars. It is named after Law School alumnus and university trustee David M. Rubenstein, whose recent gifts to the Law School support full-tuition scholarships. The University aims to break ground on the Rubenstein Forum this year, with a 2018 completion date. A more detailed timeline will be released in roughly three weeks, according to University spokeswoman Calmetta Coleman. Coleman also indicated that renderings will be released to the public in the coming weeks. Charles Stewart Mott was a founding partner of General Motors and a three-term mayor of Flint, Michigan in the early 1900s. Mott donated $1 million to the University in 1957. Two years later, the Mott building opened its doors to house the Industrial Relations Center, a research hub for business and industrial organization. Most recently, the Mott building contained University administrative offices. By Wednesday afternoon, the building’s three stories of glass and limestone were completely demolished, leaving the plot of land filled with bent and buckled remains. The oft-overlooked Mott follows the fate of the Research Institutes building, which, like Mott, was a mid-century building designed by the firm Schmidt, Garden, & Erikson. The Research Institutes building was demolished in 2012 to make room for Eckhardt Research Center. The Rubenstein Forum will be designed by Diller Scofidio + Renfro (DS+R), a New York City–based architecture firm. DS+R’s portfolio includes New York’s High Line—a park built along an old elevated rail line—and the recently-completed Broad Museum in Los Angeles. The firm is also a finalist to design the Obama Presidential Center.